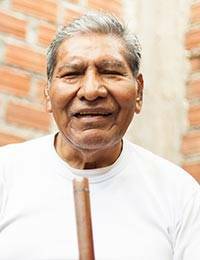 The sweet tunes of the zampoña panpipe serenade the Andes with nostalgic songs. 'The use of the zampoña has become widespread across the world and it is played at different functions,' explains Benito Tito. 'In Peru we play the zampoña during special ceremonies and traditional rites.' Tito crafts this zampoña by hand with 13 bamboo reeds of the same diameter but different length. The pipes are tied together with a woven ribbon.